9 Therefore is the name of it called Babel; because the Lord did there confound the language of all the earth: and from thence did the Lordscatter them abroad upon the face of all the earth. 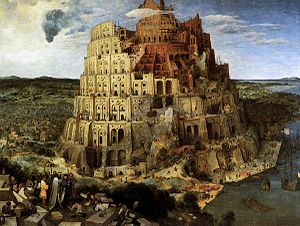 Babel, for narrator, choir and orchestra (composed in 1944) by Igor Stravinsky (1882-1971). Part of The Genesis Suite, which was commissioned by Nathaniel Shilkret and was premiered on Nov. 18, 1945.